An interesting article out of Brunei, of all places, reported yesterday that American stogie sales jumped a whopping 28 percent from 2000 to 2004. This news is even more stunning considering cigarette sales declined ten percent over that same time period. The article quotes Action on Smoking and Health Executive Director John Banzhaf – an anti-smoking zealot, not an impartial expert – claiming marketing campaigns, low taxes (excuse me?! 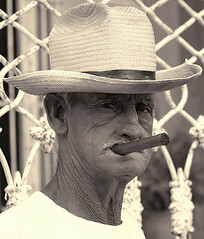 ), and cigar wielding politicians are to blame for the surge in stogie sales. Also, stogie smokers do not inhale. So while their risks for oral cancers are marginally higher than nonsmokers, heart disease and lung cancer rarely enters into the equation. The alarmist article provides additional insight when it cites a recent study out of Cleveland that found, out of the 4,000 plus teens polled, 23 percent prefer cigars, compared to only 16 percent who prefer cigarettes. This research – albeit limited in scope – contradicts two public misconceptions: (1) that teen tobacco consumption is almost entirely composed of cigarettes; and (2) that the average cigar smoker is a senile, porch occupying grandpa. For those of you who question the validity of half-baked “reporting” out of Brunei – as you should, especially given the local media’s strong ties to Sultan Hassanal Bolkia – the research does square with an October AP article that ran in hundreds of American publications. That article prompted us to write a commentary about avoiding the pitfalls of the mid-90s cigar boom. What's even more impressive is that cigar sales are steadily climbing in the face of intrusive smoking bans. This shows that "health" advocates' argument that bans discourage smoking does not hold water. That point was further proven in Thomas Lambert's "The Case Against Smoking Bans" from Cato's Regulation magazine. Bye bye Baltimore…pretty soon MD won't need a State wide ban since every locallity here is banning smoking on their own. Which brings me to this question to the Stogie Guys…with tobacco taxes at an all time high and increasingly more and more bans are being enacted, whats responsible for the growth? To be honest, I don't think smoking bans have nearly as much impact on cigars as cigarettes. In recent decades, cigars had become unwelcome in many restaurants and bars that allowed cigarette smoking. Also, don't forget the number of premium cigars sold is tiny compared to cigarettes. 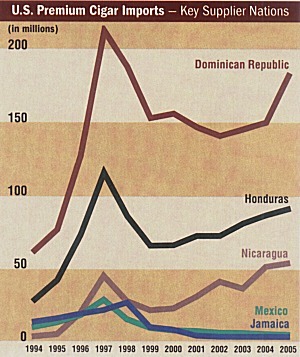 Cigar Cyclopedia reported yesterday that in 2006 the U.S. imported about 311 million premium cigars (a drop from the previous year). Compare that to U.S. annual cigarette sales of roughly 375 billion. I think the popularity of cigars is actually rather simple: it is incredibly enjoyable, relaxing and relatively inexpensive.